It's important that a man be able to protect himself in dangerous situations, especially if those situations involve bone-chilling quantities of invigorating apricot facial scrub. Making sure you're adequately protected at your most vulnerable, Soap Weapons. Just-launched, Soap Weapons are exactly what they sound like: to-scale hand poured glycerin representations of tools of violence inspired by the SoCal-based owner's childhood soap, which was molded to look like the Dukes of Hazzard's General Lee, such a fun shape it left him Boss Hogging the tub. Shapes include hand grenades, Beretta-style pistols, and brass knuckles, plus each comes in your choice of scent/color, including the coconut/lime "Green Warrior," the breezy, blue "Secret Ocean," and the sorta musky "Black Stallion," also the name of a movie you definitely never made your mom rent, then watch with you at least until after the scene where Alec gets scared by the cobra. 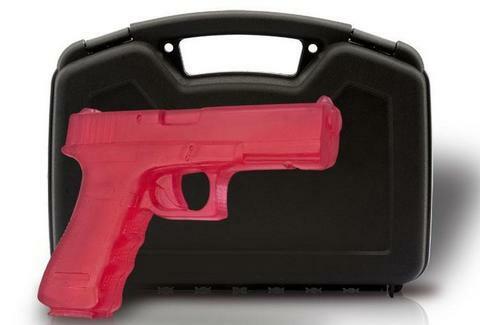 In addition, the guns come in actual, hard-shelled, foam-filled gun cases that're also available for sets of three grenades, unlike your cowardly wingman who was all, "Dude, I can barely handle one". If being clean isn't your thing, Soap Weapons has a sister company w/ arms and ammo that're all made of chocolate, which'll protect you from another dangerous situation: losing weight.